It’s interesting how the year looks from when Lent begins and how Easter passes. Our New England winter was quite the metaphor moving from a cold, dark snowy winter, to an even colder, darker, snowier one that showed no signs of ending. Then … finally (some) warmth and light. Every Lent, every Advent, everything, should be different in some way from one year to another. In my mind if one can be copy and pasted to another, one probably didn’t gain much from it. It should be different because despite how monotonous and tiresome things might feel, in actuality, life is different. – First the spiritual – the movie Frozen ; I know, I know, but our entire family unabashedly loved it. Hearing our two year old singing, “Let it Go” every morning will always bring a smile to my face. – A more spiritual highlight has been observing our boys understand more and more of the Easter story. We have been intentional about not being overly graphic and this year we focused on how Jesus loved us by giving life to all those who believe in him (substitutionary atonement can wait til next year). – Lent was filled with many wonderful moments as well. Two dear friends of mine had children born in the same week. Both families each have their own stories – both wonderful and incredible and I can’t be happier for them. As I’ve said about most events I attend, I think it’s really important to consider what you hope to gain from the experience. Last year, I was feeling a bit more sarcastic. This year has been pretty hectic and I feel the possibility of going through the motions here. So being intentional about being present and open to receive what the Lord shows me feels necessary and a part of faithful stewardship. Some first thoughts heading out: I’m not completely settled on being in Nashville. Why Nashville, Gabe? It’s the home of so much of the sub-culture that I … hmm, what word am I looking for … “hate” feels too strong, “am annoyed by” feels a bit light, I don’t know but Nashville feels like it’s contributed to the problem of the Christian sub-culture. I’m sure people will tell me I have it all wrong, there are some really great pockets of counter-culture, etc. I don’t deny this but it’s probably also true for places like Cleveland as well but I doubt Q is headed there ;) (Umm, no offense Cleveland). In any case, I’m excited that I will likely walk away gaining something completely different from what I initially thought – I welcome this. And sometimes the gain comes months down the road. Still, it’s good to consider what gained up front. My first two years there, I remember so many of the presentations simply blowing my mind. “I never knew that, thought of that, or cared about that!” In more recent years, I’ve stopped hoping/looking/waiting for that. I find that I risk objectifying/sensationalizing each presenter/presentation. And it’s a poor stewardship. 1. I want to get deeper into the conversation of “serving the common good.” Some call is the missional church conversation, the justice conversation, Kingdom living, whatever. I want to learn, do, grow, and show others what it means to serve in Jesus’ name for the sake of others, without strings attached. 2. Catching up with friends. Even though I spend countless hours on the phone, I am admittedly terrible at staying in touch. I’m somewhat comforted by the fact that many others are too. But the reality is that you really can’t be great friends with everyone and the great thing is there are wonderful people and allies all over the place. So I’m looking forward to catching up with great friends, making new ones, spending time with allies and having amazing conversations with some people that I may never see again. 3. Though I’m not crazy about adding more books to my reading list, discovering new writers, blogs, sites, etc. is of great value to me. I like to have a sense of what’s out there and I like to be stretched. 4. I can’t relate to everything that is being presented, but it’s good for me to raise my awareness at least on a general level of certain topics and issues that are not in the center of my radar. It’s also interesting to me how through the years, your heart finds an appreciation for certain topics you previously found disconnected/uninterested from. 5. As one who feels his calling is to serve those disenchanted with the Church, specifically the Over-Churched and the Under-Churched, Q is one of the best post-evangelical conversations I have found. Anything I can gain on this front would be so worthwhile to me and to those I serve. 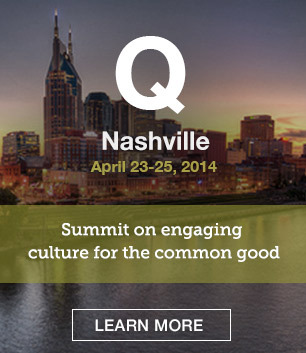 If you’re reading this and attending Q, what are you hoping to gain from our time this year. In the meantime, know that I would love to connect. Find me on Twitter @tg24 or in line for coffee or email me. “We find ourselves in the middle of Holy Week one year since the Boston Marathon bombings and I can’t help but see the similarities of the innocent dying at the hands of evil men. Spoiler alert: If you’re like Frank Castanza and need to go in the movie “fresh” then stop reading. If you haven’t seen it but already engaged, I’ll do my best to not to ruin it completely for you. If you’ve seen it, would love to discuss. 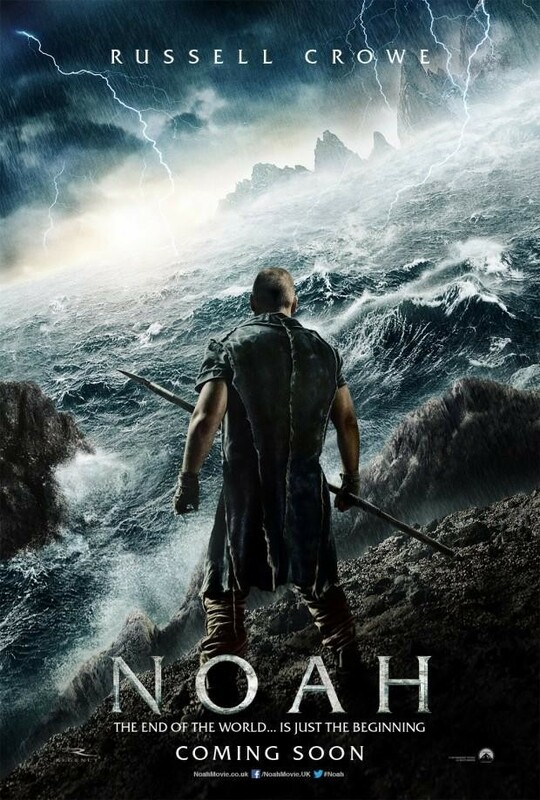 As mentioned previously, I really liked the movie Noah but among my complaints was that it moved slow. Sometimes the slowness of a movie works like with Drive. But in this case, it was slow and it was difficult to figure out how much time had passed between scenes. If I see it again, maybe I’ll feel different. I also found the need for the hallucinogens to be annoying as well. I just don’t understand why they were needed to produce Noah’s visions? Earlier in the movie, Noah’s wife, Naameh sprinkles some hallucinogenic pixie dust to help him sleep resulting in his first vision. Then his grandfather Methuselah gives him a drug and he has another. Now my family works a little different but I’ll avoid judging.